Ichimame, a maiko, stands outside an elite restaurant in the Kami Shichiken geisha district of Kyoto. Photo by Perrin Lindelauf. So I thought too, until I met Chris Rowthorn, longtime Kyoto resident and head writer for Lonely Planet’s Japan and Kyoto guidebooks. Regular customers vouch for their friends, which in turn reassures the geisha house or restaurant that the client is reputable. Fortunately Rowthorn, who offers private tours of Kyoto, offers geisha entertainment to his clients, so I signed up immediately. Two weeks later we met in front of Kitano Tenmangu, a large shrine in northern Kyoto, and we walked to nearby Kami Shichiken, one of the city’s five geisha districts. Night had fallen and the street was lit by paper lanterns casting a warm glow over each traditional restaurant. The staff of the restaurant where Rowthorn had made reservations greeted us at the door and led us to a private dining room with a tatami floor, sunken table and soft, low lighting. Good times: Our scribe was often speechless in the presence of Ichimame. A waitress took our drink orders and we waited, my anticipation building by the moment. Suddenly the door slid open and there knelt Ms. Ichimame, our maiko entertainer for the evening. She bowed deeply and introduced herself, smiling slightly. 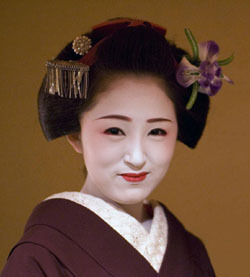 Ichimame is said by some to be the loveliest maiko in Kyoto. Even without her maiko accouterments, she would be described as a traditional Japanese beauty, but the combination of her gorgeous kimono, elaborate hairstyle and bright makeup was stunning. The makeup was particularly striking, as it blended naturally with her features and was mixed with a fine shade of pink on the cheeks that deepened into crimson about her eyes. As the evening passed, I nearly forgot she was wearing any makeup, until our unadorned waitress brought out each course. While I sat speechless, Rowthorn, acting as my guide and interpreter, got the conversation started and translated Ichimame’s lilting Kyoto dialect. “At first, everyone has lots of questions about my life,” said Ichimame. 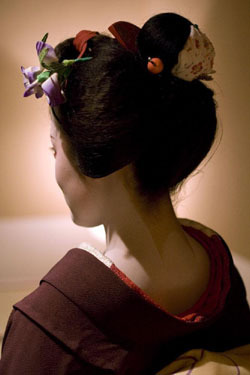 I was no different, and as we started our first course, I began asking her about her start as a maiko. Few junior-high-school students have any notion of their future working lives, but prospective maiko make the decision to join an okiya (geiko house) in their early teens. “I went to the spring Kitano Odori (the Kami Shichiken biannual dance performance) when I was 11 and decided right then that I wanted to be a maiko,” Ichimame said. Even though she was only 11, her dream had taken root, and with her parents’ support she entered under the protection of her okiya and her new “okasan” (“mother” — the title for the head of the geisha house) when she was 15. A maiko’s apprenticeship usually lasts six years, and Ichimame, who is now 20, has completed most of her training and will become a geiko next year. Just like any other professional entertainer, her training regimen is rigorous: during the day she rehearses for dance performances, practices the shamisen or a wind instrument and then prepares to meet her clients, dressing in three layers of gorgeous kimono and doing her own makeup. “At first my okasan helped, but now I do it all myself,” said Ichimame, smoothing the broad curves of her hairstyle self-consciously. It was gestures such as this that made Ichimame fascinating to watch. As we chatted she occasionally tilted her head, giving us something between a nod and a bow, while at other times her smooth, picture-perfect demeanor broke into a small peal of laughter, exclaiming “That’s right!” to a joke like any other young woman of 20 years. As we finished our courses, she gracefully removed the dishes and asked how they were. Once when my cuff caught and turned my tray slightly, I watched stunned and a bit embarrassed as she immediately adjusted it back to perfect alignment. As each new dish arrived, I found myself torn between the amazing kaiseki (Japanese haute cuisine) meal and our lively conversation. I had tried some of the dishes already — miso soup, sashimi, tempura — but many were new to me. Grilled and salted ayu (sweetfish) was accompanied by a slightly bitter sauce, while a salad was tossed with hamo (sea eel), a Kyoto specialty, and drizzled with a sour dressing made from pickled plums. Sabazushi, a large mackerel sushi roll wrapped in salty konbu (kelp) came out last, before a simple dessert of perfectly ripe cantaloupe. Conversation turned to changes in clientele, as I wondered whether she had entertained many foreigners before. Getting to know a little of the woman behind the makeup was what I enjoyed most about our private dinner. Privacy is perhaps the hardest for her to come by, so she has embraced her public role, writing a blog about her daily life and a book titled “Maiko no Osaho (The Manners of a Maiko),” which is published by Daiwa Shobo. For now, Ichimame is enjoying her last year as a maiko and will soon trade her bright kimono for more subdued geiko colors. 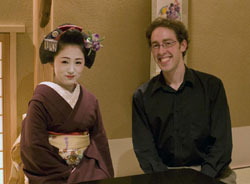 As the evening drew to a close, I asked if her life as a maiko was as she had expected. “It’s everything I had hoped for,” she replied with a smile. As we walked down the quiet street after dinner, I looked back to see her standing in the doorway, bowing in the low lantern light.